Dramatic video footage shows the moment a drink-driver cuts across a roundabout at speed, narrowly missing a van, before leaving the road and crashing into a pole. 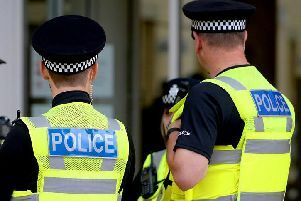 Police said Jordan Johnstone, unemployed, of Staplefield Road, Handcross, was nearly three times the limit as he sped across Cheals Roundabout in Crawley in a black Mercedes ML320. The 20-year-old has been banned from the roads for three years after footage of the incident on June 7 was captured on his in car dash cam. Police said Johnstone was travelling towards the roundabout at around 45mph. The footage shows him cutting across the corner of the roundabout before narrowly missing a white van and crashing into a grass verge. Officers said he hit a pole before he attempted to make his way back onto the road, travelling along the Crawley Avenue towards Pease Pottage. He came to a stop on Brighton Road after realising a tyre had burst and he was spotted by a police patrol car. Officers pulled over to assist and he was given a roadside breathe test where police say he was found to have 104mcg of alcohol per 100ml of breath in his system. The legal limit is 35. He was arrested and charged with drink-driving, driving without due care and attention, driving without a valid licence and driving without insurance. At Crawley Magistrates’ Court on September 4, Johnstone pleaded guilty to all four offences and was sentenced to a 12-month community order. He was also disqualified from driving for 36 months, ordered to pay £200 costs and a £85 victim surcharge. Investigating officer, Sergeant Chris Glasspool, said: “This footage demonstrates just how dangerous and irresponsible drink-driving is. Being under the influence of alcohol can seriously impair your ability to drive, as is clearly shown here, and it’s extremely fortunate Johnstone didn’t injure himself or anyone else. “There’s simply no excuse for it. If you’re going to drink, leave your car at home; book a taxi, take public transport or get a lift with someone sober. Don’t risk it, we can assure you it’s not worth it. “Every year in Sussex people are killed or seriously injured as a result of drink or drug-driving. Just think the next time you drive under the influence, you could kill yourself, a friend or a family member. Try living with that on your conscious.